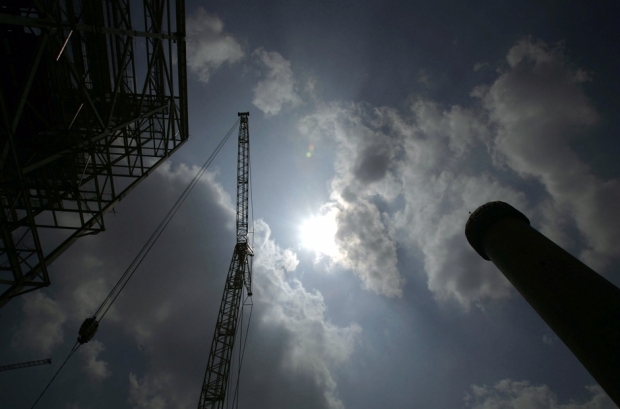 The Guohau Power Plant under construction in Shenmu county, Shaanxi province, in May 2005. The central government’s “Go West” campaign intensified efforts to accelerate development and prosperity far from the nation’s developed eastern seaboard. Shenmu Rolled in Cash When Coal Prices Soared. Now Private Bankers are Fleeing and the Local Government is in a Bind. This story by staff reporter Li Yan was first published by Caixin. A financial crisis triggered by falling coal prices is brewing in Shenmu County, in the northwestern province of Shaanxi. Construction projects have been halted, universal health care has run into payment problems and many private bankers have disappeared in the last few months, all indications that another story of legendary development is now just a bubble bursting. The richest county in the province, Shenmu is blessed with abundant coal reserves. Buoyed by rising prices in the last decade, Shenmu enjoyed the birth of a vibrant mining industry. Accompanying this were rampant private lending, skyrocketing real estate prices and government largesse in social spending. The county’s 400,000 residents were the happy recipients of China’s first universal healthcare scheme and free education for 15 years, six more years than the national minimum. All of this came to a sudden stop when coal prices went south two years ago. Coupled with a slowing economy, the central government’s determination to curb excessive capacity and tighter rules on mining coal, Shenmu suffered an economic slump that has already triggered social unrest. On July 26, Lei Zhengxi, the county’s Communist Party secretary, was removed from his post. Yang Caimao started working in a coal mine at age 19. Now 39, he is one of the most savvy dealers of coal mines in Shenmu. He owns stakes in a dozen mines, and his day job is flipping collieries for quick gains. Shenmu, Shaanxi’s largest county, has a reserve of 50 billion tons of high-quality coal. Between 2005 and 2011, the price of the stuff widely used to generate electricity across northern China rose from 50 yuan per ton to 500 yuan. The county’s total production per year jumped from less than 86 million tons in 2005 to 200 million tons in 2012. Shenmu owed some of its success to good fortune. Before the Olympic Games in Beijing in 2008, the central government halted production at mines in provinces around the capital to reduce pollution. Shenmu stepped in to fill emptying coal buckets. The 4 trillion yuan stimulus package unveiled in late 2008 was another boon. Shenmu’s coal businessmen not only raised prices in the local market, but also bid for mines in Xinjiang, Gansu and Hubei. Speculation in coal mines became something of a fad. A mine worth 200,000 yuan in 2002 went for as much as 4 billion yuan last year, Yang said. Many buyers had no interest in production. Flipping mines was their game. In most local deals, some reaching into the billions of yuan, cash payment was not expected. The parties settled with IOU notes. Loan sharks were relied on to keep the game going. Speculation in mines and private lending grew hand in hand, Yang said. They collapsed holding hands, too. The Shenmu government website says the county has 21 banks and 22 micro-financing institutions, the largest number among of Shaanxi’s counties. In fact, most financial activity took place on the private lending market. “There were about 50 registered investment companies in Shenmu and more than 2,000 unregistered pawnshops,” said one pawnshop owner who once managed more than 500 million yuan worth of funds. The pawnshops were in fact private banks that took deposits from locals on the promise of high returns. The pawnshop then lent the money at high rates to businesses. The minimum interest rate for private lending in Shenmu was 3 percent a month, but this could go as high as 50 percent. (One-year deposits in banks had a pedestrian return of 3 percent.) The private lenders were clearly going overboard. A central bank regulation from 2008 stipulates that private lenders should cap the interest rate at four times bank interest rates. On July 29, dozens of people who had lent to the pawnshops gathered in front of a local court to ask for their money back. A chicken farmer held an IOU note with simple information scribbled on it: “Receiving 3 million yuan, interest 3 percent per month. Zhang Xiaochang, September 18, 2011.” The farmer, who did not make clear how she got the money in the first place, said she used her connections to approach Zhang, a famous pawnshop owner, to lend the money. Both he and the money have disappeared. In December, Zhang, known as the Gold King in Shenmu, disappeared with 4 billion yuan. More than 56 local institutions have financial dealings with him, and more than 1,000 lenders are involved. This included some local officials. Before the dust settled from Zhang’s disappearance, several other businessmen had fled. Soon, pawnshops were closing en masse. For those who owed more than 10 million yuan, running away was tempting, the pawnshop owner said. He said his cousin and uncle were both hiding outside the county. Together they owed hundreds of millions of yuan. Of course this latter option was possible because during the boom times Shenmu became a veritable showroom for luxury cars. Lamborghinis and Ferraris were easy to spot. The pawnshop owner had loaned out 500 million yuan: 200 million yuan from his own pocket and 300 million from 10 others. The money went to his cousin, uncle and two other friends. All have disappeared. He is careful not to panic the people who lent him money. He guards his words carefully, and drives his luxury car around town every day to signal that all is well. But of course it isn’t. The pawnshop owner has hired a 10-man team to head to Xi’an, the capital of Shaanxi, to collect the money owed him. Shenmu’s universal medical insurance scheme unveiled in 2009 is a good deal by the country’s standards. Participants foot the bill themselves if it is under 200 yuan per person in a village hospital, 400 yuan in a county hospital and 3,000 yuan in a facility outside the county. But any medical bill above this is paid by county government. The 2013 budget for the program is 204 million yuan, and 150 million yuan has been deposited into the county’s medical account, a Shenmu spokesman said. He brushed aside questions over whether the scheme is facing financial problems. However, a source from the Second People’s Hospital in Shenmu said the county’s medical insurance office owes the hospital 9 million yuan. “They delay the payment to us, now the hospital is shouldering the bill,” the source said. Shenmu’s property market has taken a rollercoaster ride along with the coal boom over the last six years. The average price per square meter for a flat was 3,000 yuan in 2007. By last year this had risen to 200,000 yuan. “Construction never stopped in Shenmu,” said Zhang Zhongmin, a real estate agent. However, since April housing prices have dropped significantly and many apartments have been seized from bankrupt owners. The streets of Shenmu are now dotted with half-finished buildings because work was halted. Wang Heping, a real estate developer behind many projects in Shenmu, died suddenly in a hotel in Ordos, in the northern region of Inner Mongolia, in June. His employees say he died owing them as much as 10 million yuan. On July 8, more than 100 protested in front of the offices of the Shenmu government. They want the government to intervene in their dispute, giving local officials one more headache to deal with in the wake of the coal boom gone bust.